We’re huge fans of Fred and their off-the-wall takes on erstwhile humdrum home and office staples. 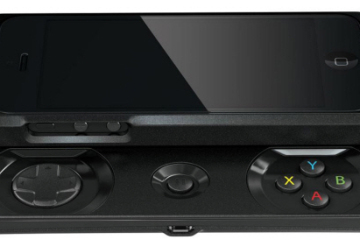 Check out what they have in store for fans in the Fall 2014. This nesting set of measuring cups consists of a mother hen that opens to reveal an egg, which then opens to reveal a baby chick. Each of the pieces (hen, egg, and chick) can be split into two halves, the bottom of which serves as a measuring cup for a specific volume, starting from a quarter cup all the way to a full cup. This should make for fun kitchen decoration when not in use, too. 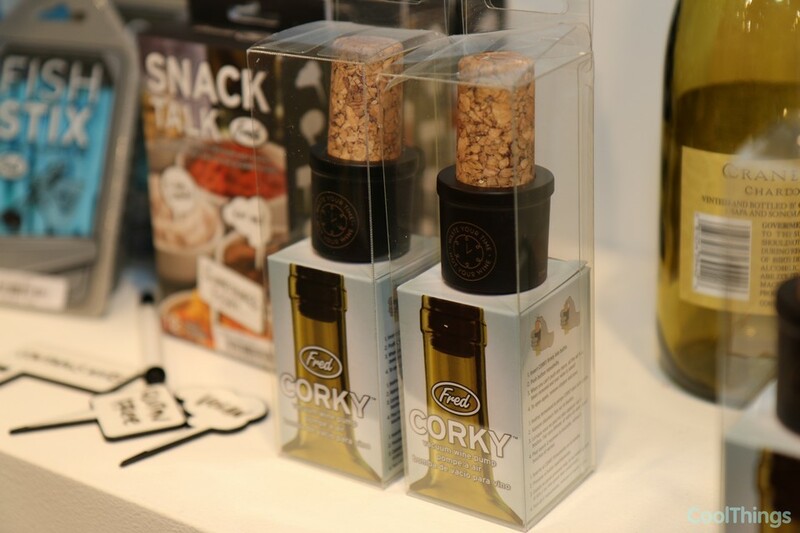 Designed for folks who don’t want to be stuck having to finish an opened bottle of wine, Corky lets you seal the whole thing back up, so you can finish any libations at your own convenience. The cork part is actually just a button, with the opposite side the one that actually goes into the bottle’s mouth. 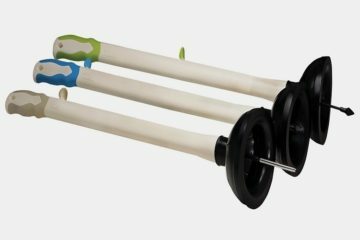 Unlike regular wine stoppers, it comes with a feature for getting rid of any trapped air by simply pressing the cork button, ensuring the vino stays fresh as can be. 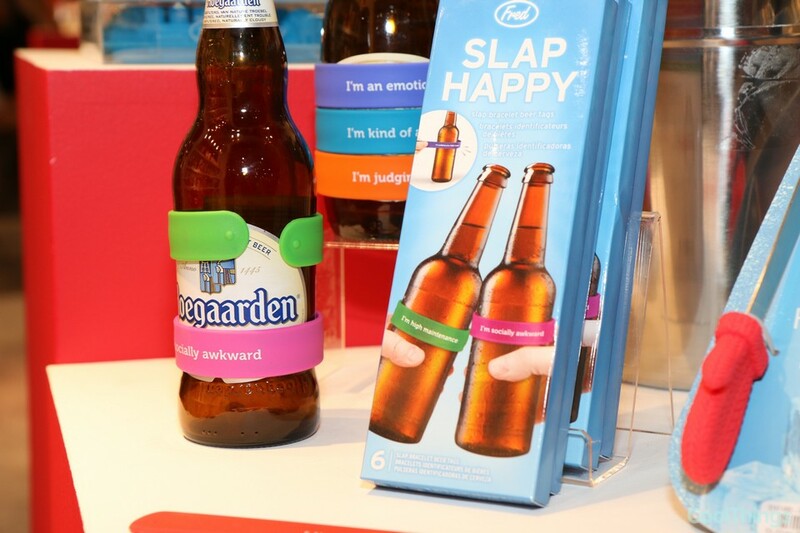 Similar to Slap Happy, these Beer Bands are stretchy “bracelets” designed to wear around beer bottles (except without the slap-to-wear design). 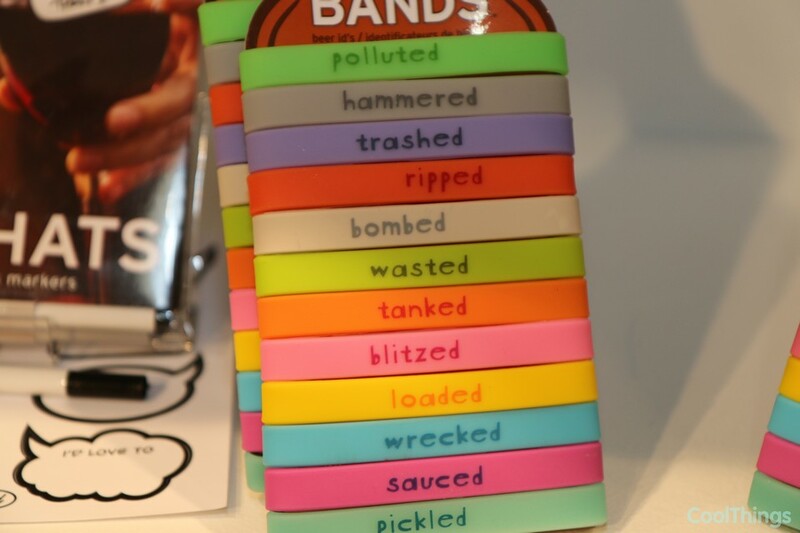 It comes in twelve colors, each one with a different label indicating your likely intoxication goals for the night, such as “wasted,” “hammered,” or just a little “pickled.” Oh yeah, they can also be stretched to fit wrists, so you can wear them around as a fashion accessory before the drinking begins. This portable wine flask is made from a soft material that allows it to be easily rolled and packed when empty for easy storage. 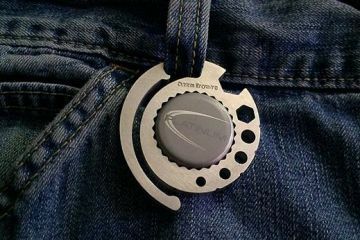 Sized to fit in your jeans’ back pockets when full, it can hold up to 12 fluid ounces of your favorite drink, just waiting to be swigged. 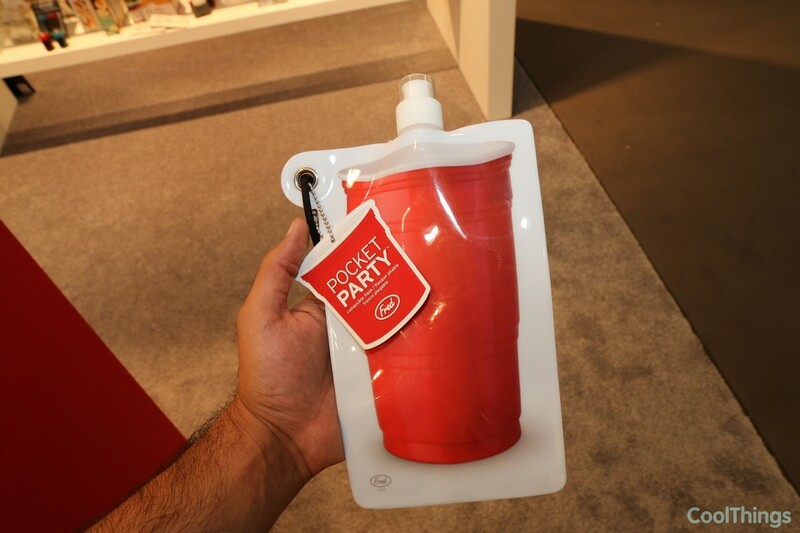 Made from flexible PVC with a food-safe PET liner, it features a red party cup graphic for giving the flask that old college party feel. A novelty pair of tongs, it features little silicone mittens on the business end to keep things warm and toasty when fetching ice cubes for dumping into your glass of whiskey. Looks almost like a pair of puppet hands mining ice cubes from the bucket. Very cute. 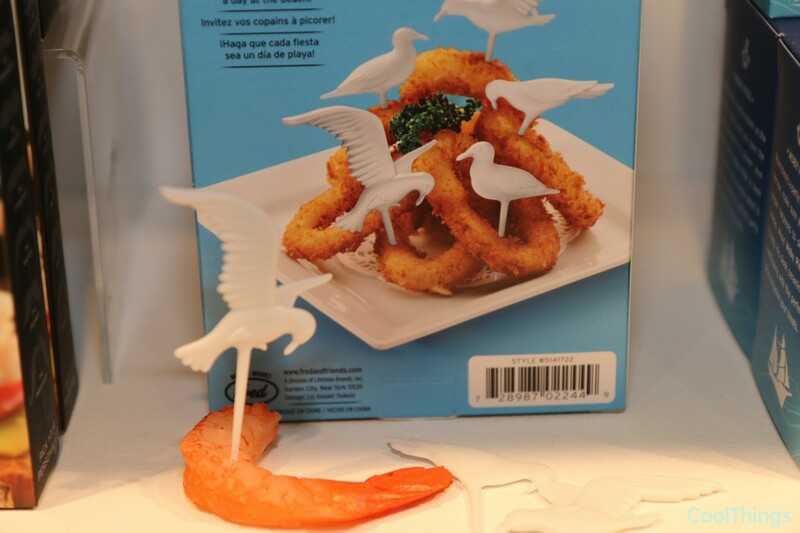 This set of party picks come in the form of seagulls stuck in a variety of poses, making it look like an army of miniature birds are snacking away at the rice cubes, shrimp balls, and onion rings laid out on your plate. Designed by Liz Goulet Dubois, the picks are made from polypropylene plastic, so they can be cleaned up for use at the next house party. A spaghetti measuring tool for those times you have a mob to feed, it comes with three large sections for sizing up the proper portions. Each of the three sections come styled as a stereotypical thugs from classic mob movies, all of them on the plump side with a mean mug on top of their shoulders. Construction is molded, food-safe HIPS plastic. Not a fan of skulls and horror imagery, but want to turn your boiled eggs into something less-boring all the same? Not a problem. 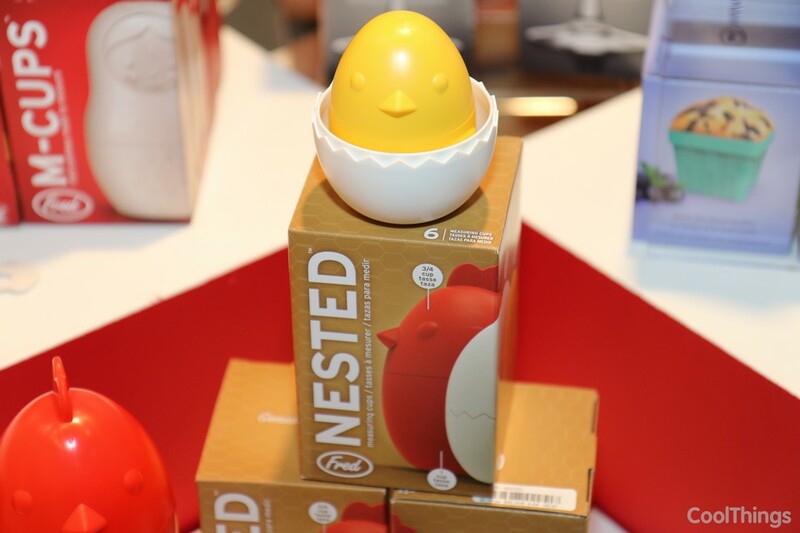 Fred’s got you covered with this Egg-a-Matic, which transforms your boiled eggs into cute baby chickens. Each one comes with a baby chicken leg base, so you can have an inanimate baby chicken standing around on the breakfast plate. 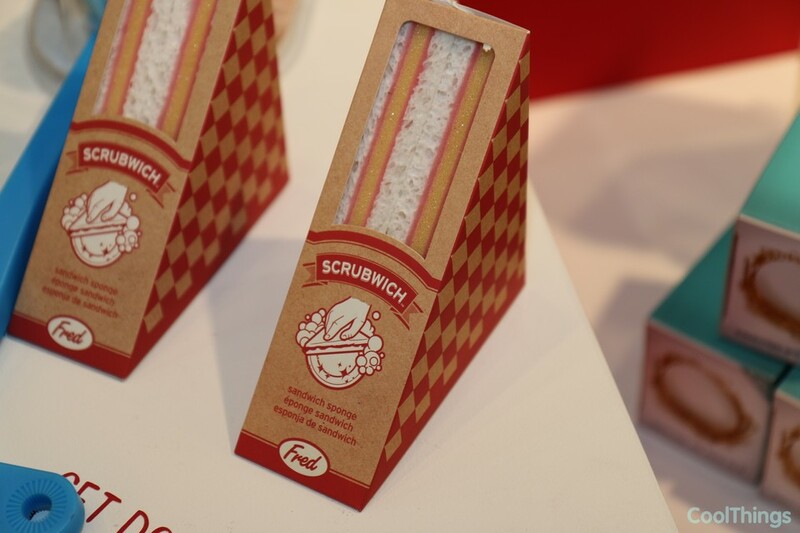 This triangle-shaped dishwashing scrub is designed to look like a sandwich. We’re not sure if it’s supposed to be chicken, tuna, or some weird form of processed meat in there, but it definitely looks like one of the items in your local deli’s menu. 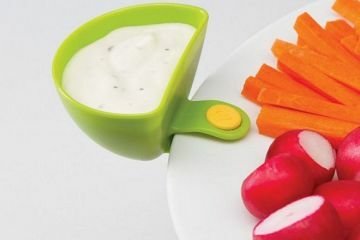 Finally, you can scrub your plates with a sandwich – life is grand. 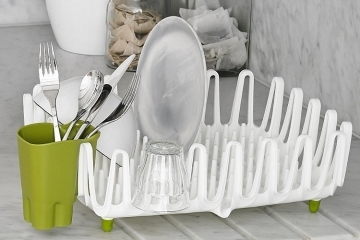 Cleaning the dishes by hand with a scrubber is no picnic. 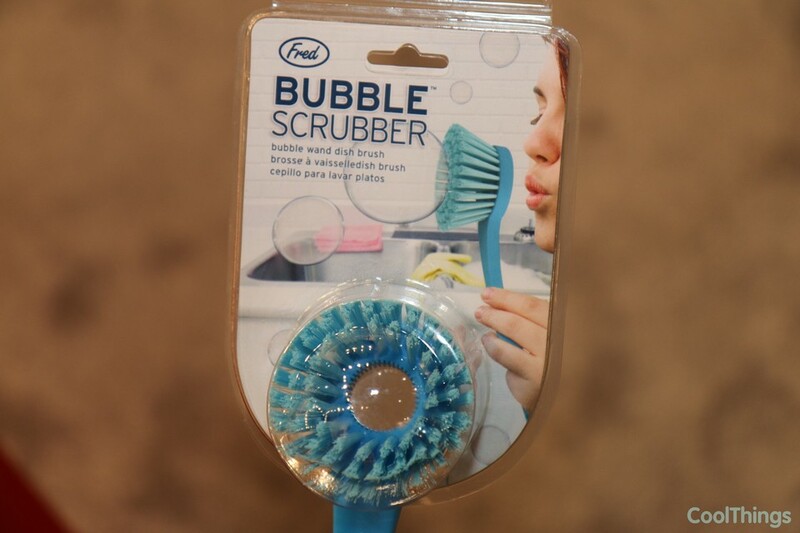 But it can be fun if you use this Bubble Scrubber, which comes with a holed out center for making soapy bubbles that float around in the kitchen. To use, just dip it into the soap suds in the sink, pull it up to your face, and muster your best puff. Hey, the kids might even volunteer to do the dishes next time. 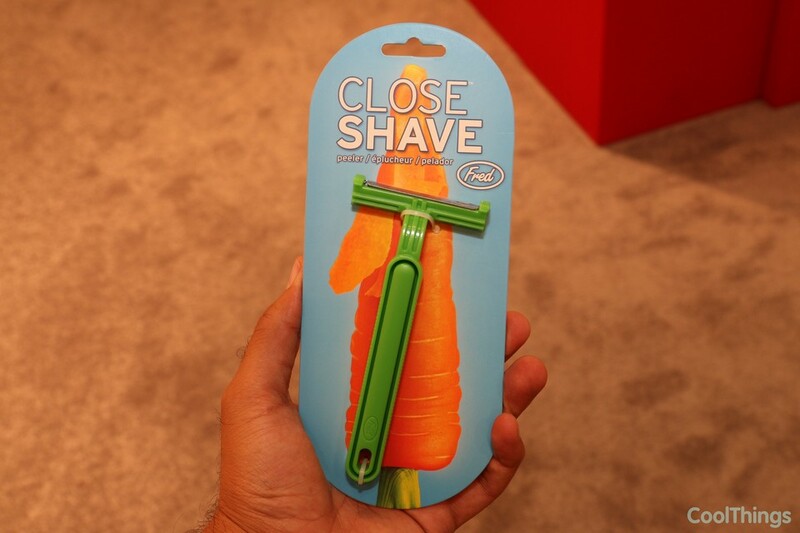 The perfect tool for men who are confused as heck in the kitchen, this vegetable peeler comes styled like a shaving razor. That way, there’s no need to learn anything new, since you can peel carrots and potatoes the same way you peel off the tiny stubbles that pop out of your face every morning. Designed by Yuk Wang, it features a polypropylene handle and stainless steel blade, just like those cheap disposable razors you buy from the drug store. Using a whale to strain anything sounds like it doesn’t make a whole lot of sense. 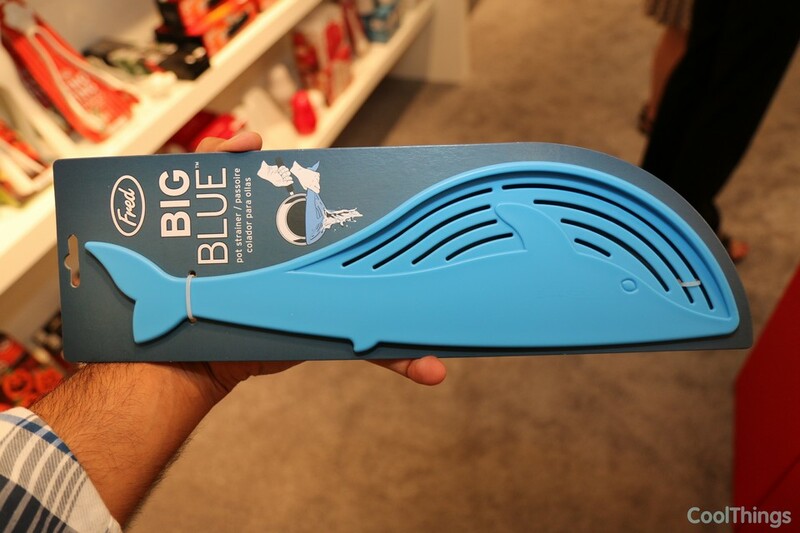 But that’s exactly what you’ll be doing with Big Blue, a pot strainer done up to look like a giant blue whale. 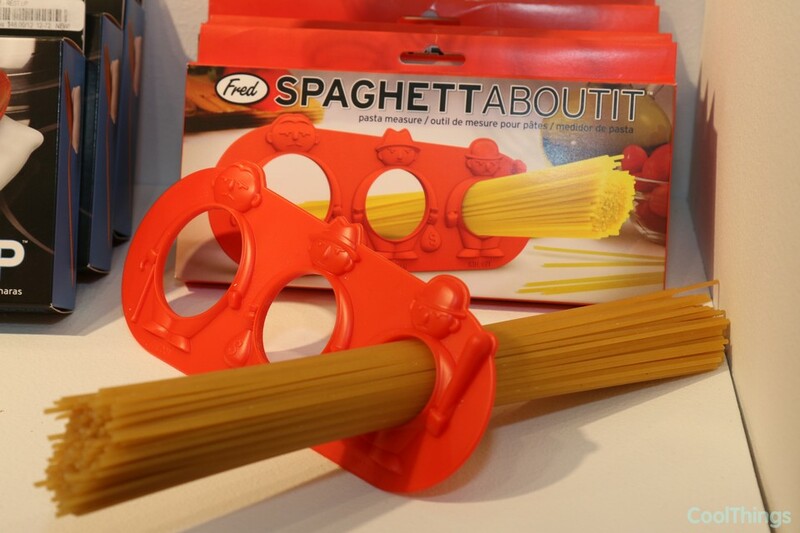 Perfect for straining water out of whale-size servings of boiled spaghetti, lenguini, or fettucini straight out of the pot. Plus, you can probably rig it to float in the punch bowl for a little extra party favor. 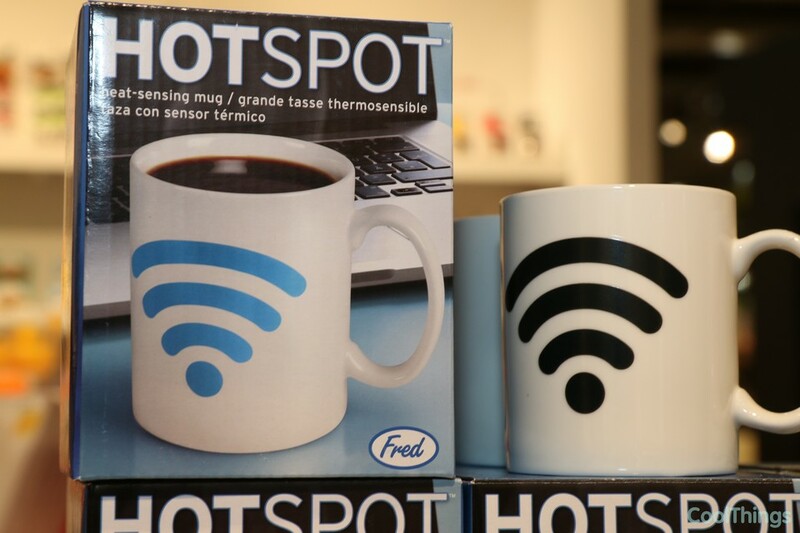 This mug features a large, black WiFi logo on the side that turns into blue when you pour hot drinks inside, then switches back to black as soon as the cup empties or cools down. Made from ceramic, it can hold 10 ounces of your favorite beverage. Oh yeah, making the thing turn blue doesn’t help your actual WiFi access whatsoever. 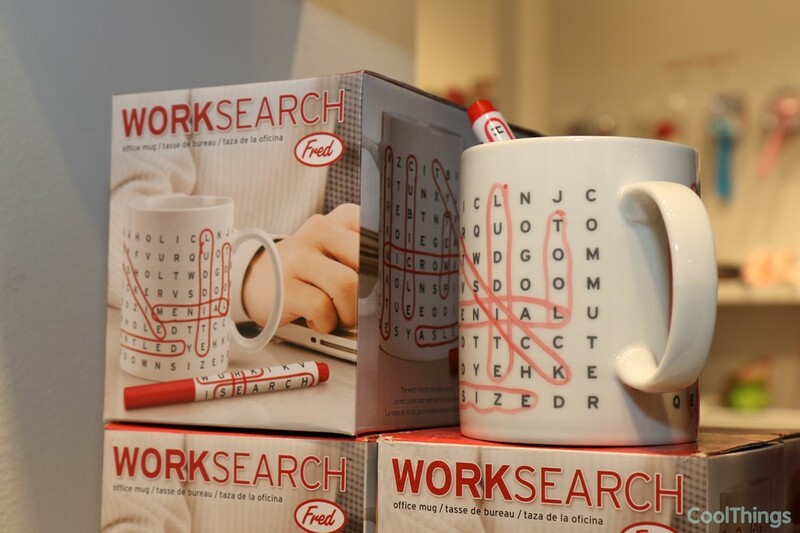 This 10-ounce coffee mug comes with a word puzzle printed on the sides, which hides multiple words related to life as a cubicle drone. You know, things like “temp,” “asleep,” “tedious,” and more. There are 23 words in all to discover, each of which you can encircle with an included marker. 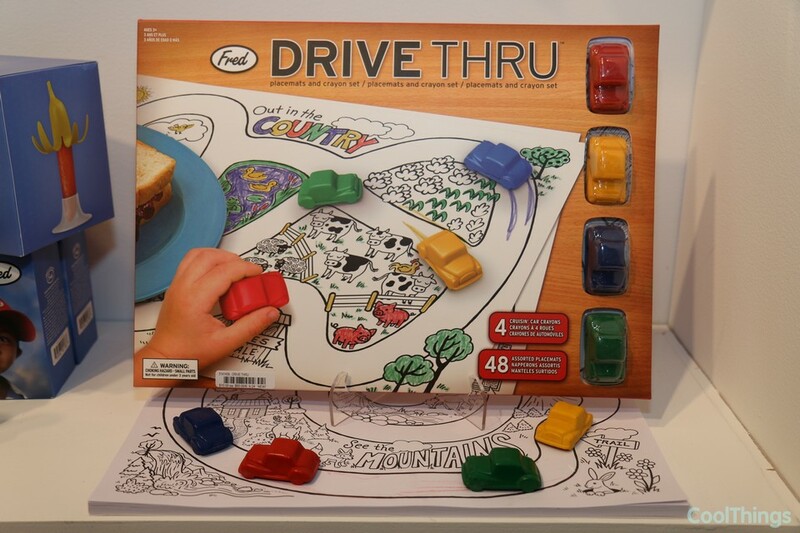 This set of paper placemats come with four different illustrated prints of driving roads that your kids can navigate with their custom Hot Wheels cars while they wait for dinner to start. It also includes four car-shaped crayons that they can use as alternative, both for driving down the picturesque roads or filling up the black and white scenes with lovely colors. Each placemat measures 15 x 10.75 inches. You use your smartphone’s front-facing camera as a mirror too much, you actually forgot how to use an actual pocket mirror. It just feels weird. 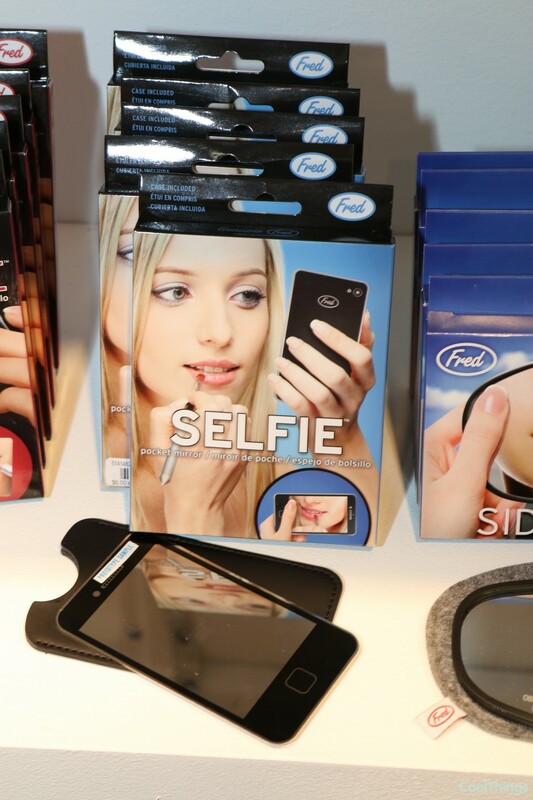 Well, this Selfie Mirror fixes that, making your reflection look exactly the same way it would look when preening at an iPhone screen. 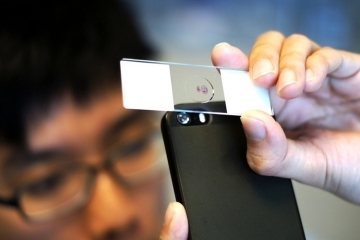 It won’t take any actual selfies, but at least, it won’t drain your iPhone’s battery either. 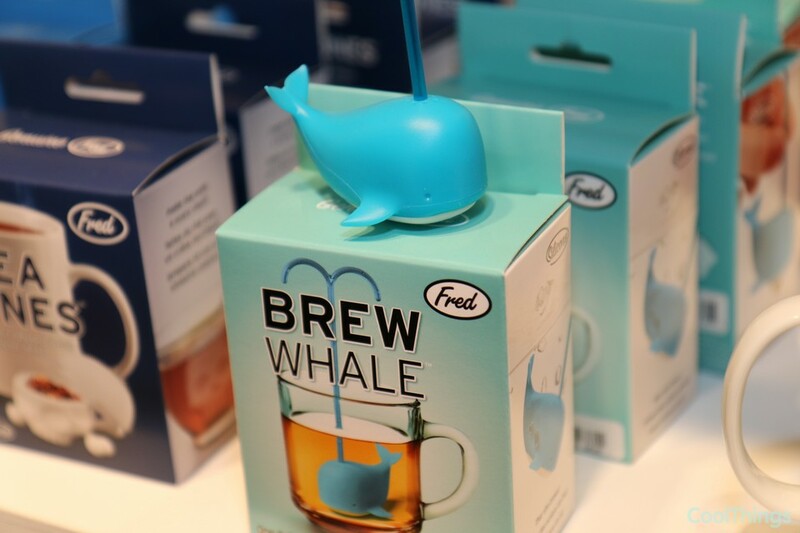 This little whale can be filled up with tea leaves and left to explore the depths of the ocean of water in your tea cup. It features a water sprout handle for easy removal after the tea has steeped, along with an easy-to-clean design that will make a splash in your afternoon tea habit. 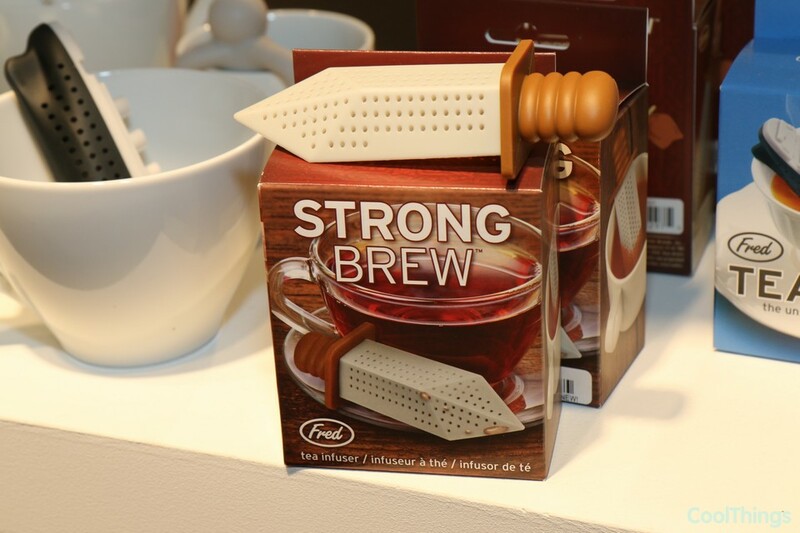 Invented by a blacksmith from Westeros (just kidding), this sword-shaped tea infuser will plunge into the heart of your tea cup and bleed the flavors of whatever tea leaves you armed its chubby blade with. Perfect for medieval cosplayers, renaissance geeks, and people who watch Games of Thrones on HBO Go while sipping warm tea. 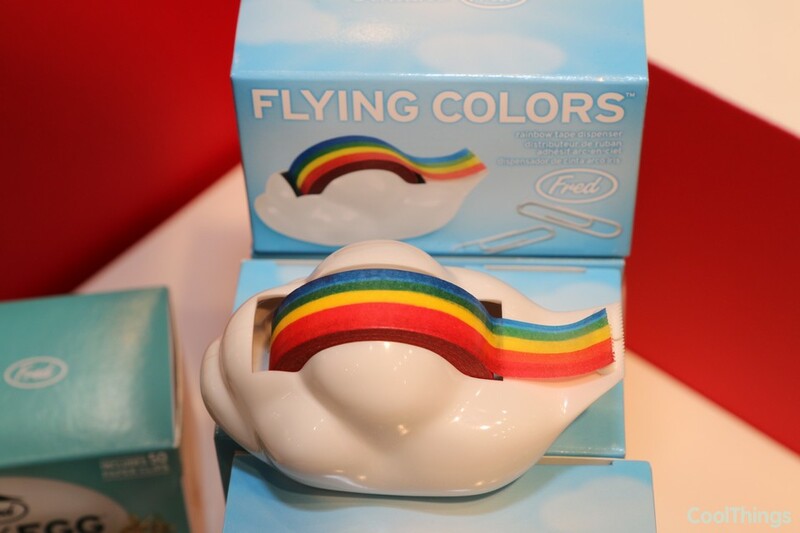 Just the whimsical office supply every drab work desk needs, this tape and dispenser package combines colorful rainbow washi tape with a cloud-shaped dispenser. That way, you can literally spit out a long stretch of rainbow any time you need it. Perfect for those times when the cubicle walls feel like they’re closing in. Sure, your life will still be miserable, but, at least, you got rainbows.